The heavy base of the Economy Force Table offers stability for all applications. A laminated wood tabletop features an angle scale marked in 1° increments. Each set of slotted masses has five 20 g, one 10 g, and two 5 g masses. 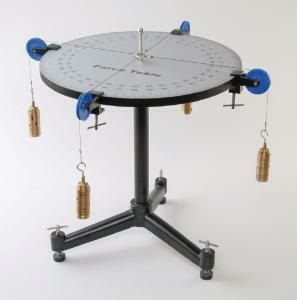 Ordering information: This kit includes 4 sets of slotted masses, four 50 g mass hangers, and 4 table-clamp pulleys.